The range of Continental sets from the 1960s carried over to the 1970s, but with a slightly revamped look. The obvious difference was the picture on the front of the box, which had a similar action shot but was drawn with more realistic figures. The interior of the sets initially remained identical to the 1960s sets, and the bigger sets still featured the red floodlights. However, these were soon replaced by the white floodlights, which first appeared in 1971/72. These new sets also saw the arrival of the C117 flags, in their familiar square orange version. The box lids also saw a couple of changes over time. 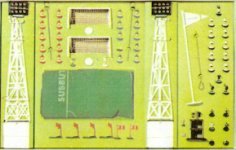 On the early sets, the address for Subbuteo Sports Games was simply Langton Green, Kent. Later this was revised to Tunbridge Wells, Kent, England. 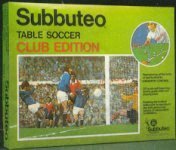 On early club editions, the sides of the Langton Green box had "Subbuteo Table Soccer Club Edition" in big print. On the later boxes this wording had been reduced in size to allow for four other languages (French, German, Dutch and Italian). 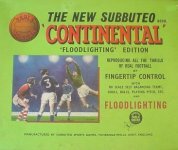 Subbuteo really had gone Continental. Same contents as 1960s version, two teams, two balls, two goals and an instruction book. As with the 1960s version, this had the contents of the Display Edition and a pitch. It also gained line/corner flags (C117). Like the 1960s sets, the players in these editions were usually those with their feet moulded to their bases. See the Player Types page if you are unsure of what these players look like. I don't know why these figures were used. I suppose it was cost, or ease of assembly, or ease of painting or a combination of these things. It was pot luck which type of moulded players you got, although the "winged shorts" version seems to be the most common in this style of set, with the "walkers" being more common in the 1960s. You can probably see in the interior pictures above that extra card supports were added to the bigger sets. It is worth noting that the floodlight supports only held an unassembled floodlight. Once these had been assembled, they no longer fitted the support. As it was a pain to take the floodlights apart, the card support was often discarded. Here is a very odd interior tray variation spotted by box set expert Karl Warelow. 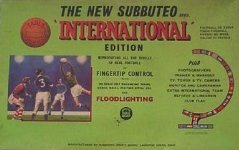 His 1970 version of the International Edition (red floodlights), has a completely different arrangement for the "additional content" inner tray. 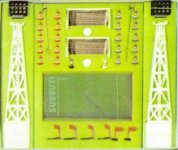 This was clearly produced to incorporate a team with the new green plastic goalkeeper rod, and shifts the position of all the accessories except the TV tower. The team looks neat, but it is not a satisfactory arrangement for the other items, especially the poor cameramen/manager/trainer set, which is scattered horribly. For perhaps this reason, this interior does not seem to be much used. Later sets return to the more common metal keeper set-up (such as Karl's 1973 set, shown here for comparison). The 1970/1974 World Cup Editions. 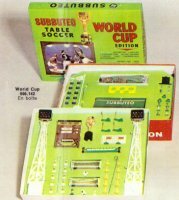 A World Cup Edition was first produced for the 1970 World Cup, and this was the first set to have two tiers. The box lid was the same size as the Floodlighting set, but the box was deeper allowing for a bigger range of accessories to be included. 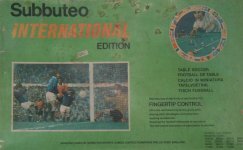 The first World Cup edition this had the contents of the international edition plus a red fence surround (C108), matching red half-time scoreboard (C111), normal scoreboard (C115), Jules Rimet trophy (C119), the target board (C124), and a ref's whistle (Set V). The goals were the "new type"(C122). In this first version, the floodlights were still the red ones. The box had the word "new" on it. World Cup (1974) This later version was basically, the same set as the World Cup 1970b version, but with further modern touches. The new "World Cup" goals with red and blue netting (C130) were introduced in 1972-73 and were an obvious addition to the World Cup set. I believe this was also the first full edition to feature teams with plastic goalkeeper rods, although these were introduced back at the beginning of the 1970s in team sets. Here's another quirky bit of set packing from Karl Warelow. 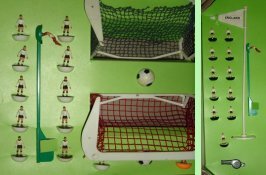 His 1974 World Cup set has spaces added for goalkeepers with plastic rods.... but the old spaces for the old 'keepers still exist. The holes have been filled with a spare player for each team (England, West Germany, and Holland). The Munich World Series 1973-76. This huge set was only available 1973-76. 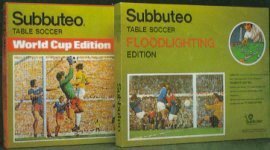 If the World Cup set of the time was a two-tier version of the Floodlighting Edition, this set was like a two-tier version of the International Edition. 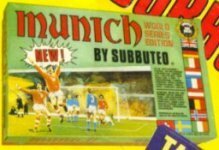 It is often seen as the "holy grail" among Subbuteo collectors, just because many of them originally played in this era, and the Munich was an unaffordable want. In truth, like all box sets it isn't all that rare, but that huge box is hard to find in good condition. As with the other sets of the time, all the contents were all available separately. Caught between the old boxed range and the new was this original Stadium Edition. This monstrous set was the first to have three tiers, but was slightly narrower than the International Set. Note that the floodlights cannot fit into the box as they usually did. 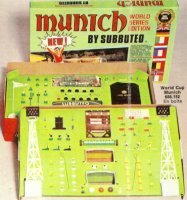 Obviously designed to show off the new grandstand, it replaced the Munich Edition as the top of the range set. The 1977 version of this had the contents of the floodlighting edition plus a grandstand (C140), photographers (C104), refs and linesmen (C107) TV Tower (C110), half time scoreboard (C111), policemen set (C113), old scoreboard (C115), corner kickers (C131), throw-in figures (C132), ball boys (C134), new trainer's bench set (C139), plus an extra team with extra corner kick and throw-in figures (in the correct colours). Here is where I came in. My first set was the club edition shown below. 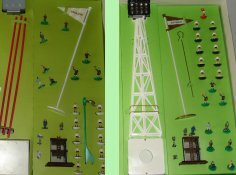 These sets were initially produced with card interiors (mine was one of these), but the later ones had the polystyrene trays also used in the 1981 range. These trays help to keep the contents in fantastic condition - but of course, you could not fill your box with extra teams and accessories like I did. There is some cross-over between these sets and the earlier ones. 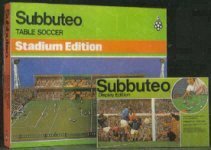 The 1977 catalogue showed the new Display and Club Editions, but the old Floodlighting and World Cup set. 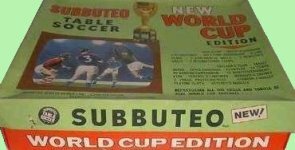 The 1977-78 box set flyer showed the new World Cup lid but it is on the old set. Shown above are two slightly more unusual items from this vintage. On the left is an International Edition with the new lid. This set was dropped in 1977, and this lid does not feature in any catalogue that I've seen. The deletion of this set saw the end of the long box size. Instead the bigger sets added tiers to the floodlighting set. So the Stadium Edition remained at three tiers but the box changed to the standard shape. 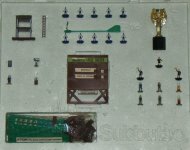 The picture on the right shows the first polystyrene insert for the 1978 World Cup set, which still featured the old brown scoreboard. The lid of this set advertised "new floodlights". These looked similar, but had a new battery box with proper connections and switch. These sets also saw the end of both metal goalkeeper rods, and moulded players. Heavyweights can be found in these sets, but the most common figure is the zombie. Two teams, two goals, two balls... same as always. Again, this was unchanged apart from the figure/goalkeeper types mentioned above. As with the club edition, this was the same old reliable mid-range set. Note that an international version dropped from the range between 1977 and 1980. However, surprisingly a set with this style of box lid has now been sighted. The new box as shown above arrived in 1978. This was not as big as its predecessor, mainly because several items from that set had dropped from the accessory range. It had the contents of the Floodlighting Edition, plus an extra team, photographers (C104), refs and linesmen (C107), TV Tower (C110), fence surround (C108), Jules Rimet trophy (C119), and the brown scoreboard (C115). A polystyrene insert was also produced for this set (see above). This isn't a common variation, so it must have been introduced only a short time before the black scoreboard arrived (see below). The polystyrene inserts allowed the range to be modular. So you added a floodlight tray to the club edition to get the floodlighting Set, and then a further tray with the other accessories to make this set (that tray is shown above). This meant a change to which items were on which layer, compared to the card insert sets, but these changes were not amended on the outer box leaving it incorrect. World Cup (1978b) The second version of this set was produced with a new polystyrene insert, to accommodate the new black scoreboard (C158). The Floodlights are advertised as "new" on the box, and feature proper battery boxes with switches. The third team in this set is usually Argentina ref 67 in Zombie form. This is the more common 1978 set, and these inserts continued into the 1980s, becoming the new "International" edition in 1982. They still didn't amend the tray contents list on the box though. This is the second version of the Stadium Edition, and simply added a polystyrene tier to the World Cup Edition shown above. This third tier featured the grandstand itself with five spectators (C140), ball boys (C134), new trainer's bench set (C139), policemen set (C113), corner kick (C131) and throw-in figures (C132) for each of the three teams, and three more balls. Again, the third team was often Argentina (ref 67) so the third corner kicker and throw-in figure were usually in the colours of Argentina. That's about it for the 1970s. The International Editions page shows some alternative sets from this era, or you can carry on to the 1980s.